As President Donald Trump’s administration has increasingly turned to sanctions, travel restrictions and tariffs to punish foreign governments, they've turned for assistance to law, lobbying and public relations firms. On a July evening, Trump administration officials and allies, including the president’s personal lawyer, Rudolph W. Giuliani, gathered with investors atop the Hay-Adams hotel overlooking the White House for a cocktail reception featuring a short presentation by the Democratic Republic of Congo’s special envoy to the United States. An invitation for the reception billed it as an opportunity to learn about “the role Africa plays in gaining access to critical minerals, such as cobalt” and to discuss “the strategic relationship” between the United States and the nations of Africa. In fact, the reception was part of an aggressive $8 million lobbying and public relations campaign that used lobbyists with ties to the Trump administration to try to ease concerns about Congolese President Joseph Kabila, whose government was facing threats of additional sanctions from the Trump administration for human rights abuses and corruption. The lavish cocktail party was one example of a lucrative and expanding niche within Washington’s influence industry. As President Donald Trump’s administration has increasingly turned to sanctions, travel restrictions and tariffs to punish foreign governments as well as people and companies from abroad, targets of those measures have turned for assistance to Washington’s K Street corridor of law, lobbying and public relations firms. The work can carry reputational and legal risks, since clients often come with toxic baggage and the U.S. Treasury Department restricts transactions with sanctioned entities. As a result, it commands some of the biggest fees of any sector in the influence industry. And some of the biggest payments have been going to lobbyists, lawyers and consultants with connections to Trump or his administration. “People overseas often want to hear that you know so-and-so, and can make a call to solve their problem,” said Erich Ferrari, a leading Washington sanctions lawyer who said he has tried to disabuse prospective clients of such notions. It is a perception that matches up with the pay-to-play mindset that defines politics in many parts of Africa, Asia, the Middle East and the former Soviet states. As politicians and executives from those regions have increasingly been targeted by sanctions, they have sought to apply that approach — backed by huge sums of cash — to navigating Washington, lobbyists and former government officials say. This has been encouraged, they say, by the willingness projected by Trump and his team to make deals around sanctions and tariffs exemptions. Previous administrations had worked to wall off politics from those processes, which are supposed to be overseen primarily by career officials and governed by strict legal analyses. In June, after a personal intervention by Trump, the Commerce Department rescinded sanctions that could have crippled Chinese technology giant ZTE, which had fought the sanctions through an intense three-month lobbying push that cost $1.4 million. A $108,500-a-month lobbying campaign has helped delay the implementation of sanctions against an industrial conglomerate owned by Russian oligarch Oleg Deripaska. Among the leaders of the lobbying efforts for both ZTE and Deripaska’s companies was Bryan Lanza, a former Trump campaign aide who maintains close ties to administration officials. His firm, Mercury Public Affairs, has signed other clients facing punitive measures from the U.S. government, including the U.S. subsidiary of Hikvision, a company owned by the Chinese government. The company, according to lobbying filings, paid a Mercury team including Lanza a fee that started at $70,000 a month to lobby on the implementation of a military-spending bill. The bill bars the U.S. government from purchasing video surveillance products made by a handful of Chinese companies, including Hikvision, ZTE and Huawei, whose chief financial officer was arrested in Canada at the request of the U.S. government, apparently on suspicion of violating sanctions against Iran. Sanctions targets who had not previously tried to win reprieve are sensing an opening. Viktor F. Yanukovych, the former president of Ukraine, who had sanctions levied against him in 2014, has discussed a push to win relief and refurbish his image with well-connected law and lobbying firms including Greenberg Traurig. Among the other Trump-linked lobbyists who have received big contracts from targets of sanctions and tariffs is Brian Ballard, a top fundraiser for Trump’s campaign and the Republican National Committee. Kabila’s government has stocked up on consultants who have cast themselves as able to broker access at the highest levels of the administration. It has paid $8 million to its security contractor, an Israeli firm called Mer Security and Communication Systems, to hire American lobbyists, according to lobbying filings. Mer paid $500,000 in April 2017 to Alston & Bird, the firm of former Sen. Bob Dole. Dole’s team indicated that it could secure a meeting between Kabila and Trump, according to people familiar with the relationship. The meeting never happened, and Mer ended the subcontract in frustration. Mer proceeded to invest millions more in lobbying and public relations firms with lower profiles but closer ties to the Trump team. Lobbying filings show $360,000 paid by Mer to Adnan Jalil, a former congressional liaison for Trump’s campaign; $250,000 to the firm of Nancye Miller, the wife of the Trump campaign adviser and former CIA chief R. James Woolsey Jr.; $680,000 to the firm of former Rep. Robert L. Livingston, an early Trump endorser; and $598,000 to the firm of Brian Glicklich, who has represented Trump allies such as Breitbart News and Rush Limbaugh. Mer also agreed to pay $1.25 million to the firm of Robert Stryk, who had worked with Trump campaign officials, to organize the Hay-Adams event and meetings around it for Kabila’s special envoy to the United States. (Stryk’s firm, Sonoran Policy Group, also signed a $100,000-a-month contract in August to represent Somalia in its bid for increased military aid from the Trump administration and removal from its travel ban list. And Sonoran registered as a subcontractor for a law firm to lobby for a notorious Serbian arms dealer who was hit with sanctions for selling weapons to Liberia). At the time of the Congolese reception, the Trump administration and the international community were pressuring Kabila to step down, partly by intimating that his allies might face additional sanctions. Not only had he been accused of violent repression of dissent and looting millions, but he had overstayed the country’s constitutionally mandated term limits by nearly two years. The Congolese officials at the reception posed for photos with Giuliani, and afterward there was some confusion about his connection to the lobbying effort. Francois Balumuene, the Congolese ambassador to the United States, suggested in an interview in Septemberthat his country was working with Giuliani to figure out the administration’s position on an upcoming presidential election called by Kabila to avoid threatened sanctions. “What I know is that it is possible that Giuliani will let us know how to go ahead,” Balumuene said. 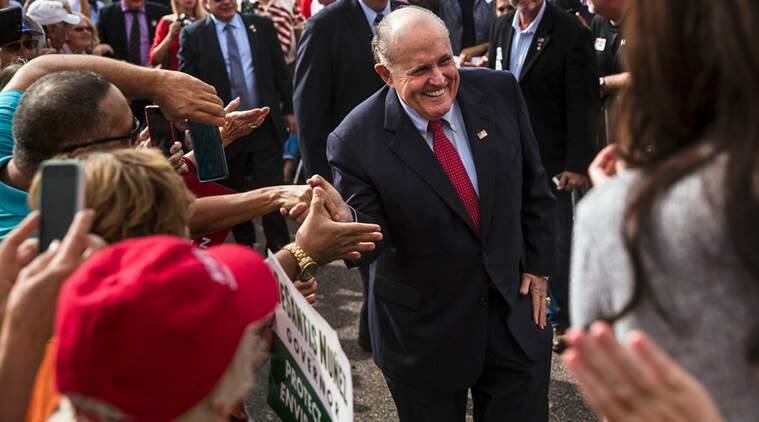 He referred additional questions about Giuliani’s role to the country’s special envoy to Washington, Raymond Tshibanda, who could not be reached for comment. And someone familiar with Giuliani’s business affairs said that one of his companies has recently been negotiating a consulting deal to work in the Democratic Republic of Congo, possibly through Mer. It is not clear whether the lobbying overseen by Mer had much effect, and several of Mer’s subcontracts with Trump-linked lobbyists have expired. Less than a month after the Hay-Adams event, Kabila announced that he would not seek a third term in presidential elections scheduled for this month. While some Trump administration officials are concerned that the elections are being tilted in favor of Kabila’s chosen successor, the United States has not leveled additional sanctions against the country since Kabila’s announcement — an outcome some lobbyists on the account are privately claiming as a victory. In October, Mer signed a new $200,000 contract with a public relations firm called Sanitas International that was co-founded by Christopher Harvin, a senior adviser to the Trump campaign who had worked in President George W. Bush’s administration. The firm is seeking to demonstrate to the news media that Kabila does, in fact, intend to step down and hold free and fair elections.